The holidays are upon us, and the spirit of Arlington holidays are some of the best in the state to keep your Christmas cheer levels up. Take a look at our list of anything and everything you can do with your family while in Arlington for the holidays in 2016! 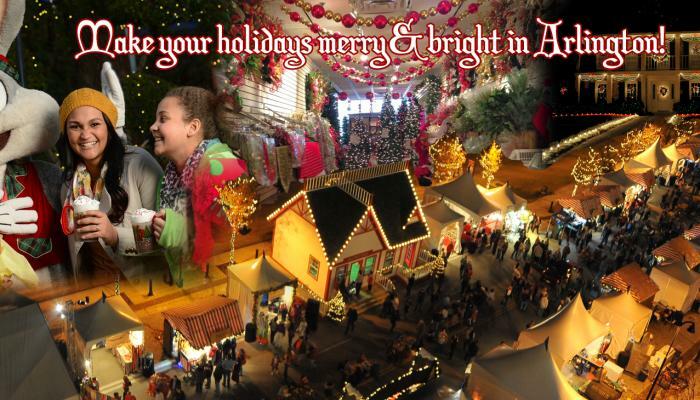 Celebrate the season German style with shopping, great food, and lots more fun for everyone in the market’s 6th year in the Arlington Entertainment District. Inspired by cherished German tradition, this family-friendly market features a unique shopping experience for holiday gifts, decorations, and one-of-kind finds. Plus, FREE admission, parking, and live music! Catch millions of lights lighting up the Arlington sky at Six Flags Over Texas’ Holiday in the Park. Let the magic lights perk up your spirit just in time for the holidays, or let unlimited hot cocoa and the prospect of sliding down Frosty’s snow hill put a smile on your face and holiday cheer in your spirit during the most wonderful time of the year at Six Flags. One of our favorite parts is the food selection – we recommend the roasted nuts and the Cowboy Burrito—meat, cheese, and potatoes made right in front of you, YUM! One of the best places in the state to catch drive-thru Christmas lights for over 40 years, the Interlochen neighborhood will be accepting the normal influx of holiday Christmas light hunter December 16- Christmas day from 7 pm thru 11 pm. Not only with the lights impress and dazzle you with a light show, but you’ll be able to take the family, crank up the “Feliz Navidad” and soak up the holiday spirit with your loved ones. Insider tip: get there early to beat the crowd! Bring your friends, family, foldable chairs to the annual Arlington Holiday Lights Parade in the Downtown/University District. Thousands congregate each year to catch the show that features floats from area businesses and organizations that ends with the ceremonial tree lighting on the steps of Arlington City Hall. Bring cameras, because Santa will be there for photos across the street from City Hall at Levitt Pavilion. Last year it was Shrek, this year get in the holiday spirit with Kung-Fu Panda! Adventure to Santa takes the timeless chance to meet Santa and turns it into an immersive holiday adventure for parents and kids alike amplified with technological wizardry that leads the whole group to the North Pole to have a private meeting and photo session with Santa. Our tip is to make a reservation, as lines at the mall can get long. Join Symphony Arlington with a Holiday Safari! The annual sing-along of cherished holiday favorites is sure to be a hit with family and friends. “Famous the world over, the heart-warming story of Scrooge, Bob Cratchit, Tiny Tim and the others is a classic of world literature. Mr. Horovitz&apos;s adaptation is brilliantly theatrical and adds elements of inventiveness and creativity that will delight audiences of all ages.” Adults are $23, seniors $21, students with valid IDs are $21 and groups of 10 or more are $18.50+ each. Breakfast with the one and only, Santa himself! At both adult and children&apos;s prices, get a personalized photo with Santa, a fun craft photo remembrance frame, all-you-can-eat breakfast of scrambled eggs, sausage patties, hash browns, and toast, plus a $10 game card good for all activities besides bowling. In addition to this great deal, if you bring one non-perishable food item, you will get an extra $5 game card! On Tuesdays thru Saturdays, December 6 through December 16 from 10 am to 4 pm, check out Santa&apos;s favorite spots in the Ballpark as it&apos;s all decked out for the holidays while the kiddos get to enjoy a story time and the opportunity to write a letter to Santa and mail it off at the Texas "North Pole" mailbox. Santa won&apos;t be there during these dates, but he&apos;ll be there December 17 for all mentioned above + Santa will be waiting at the kid&apos;s zone! Rangers Captain will be there as well, and there will be a special Searching for Santa souvenir (say that five times fast), cooking decorating and much more! For the past 14 years, Lincoln Square has sponsored Santa Land, where Santa, the elves, and Mrs. Claus are available for photos with the kids. Each child that participates will get a small toy, and all proceeds to photo purchases will go to Wish with Wings, a charity that grants wishes to terminally or critically ill children. Plus, during this time, give back to SafeHaven of Tarrant Country via the Santa’s Sack Program, running December 10-19 (12-6 M-F and 12-3 Saturdays), where Lincoln Square donates suite space to the charity where the community is able to drop off new gifts for the women and children living in their emergency shelters. Texas’ #1 Christmas store is in Arlington, come peruse more than an acre of Christmas décor and whimsical Christmas displays. One of the biggest in the world, Decorator’s Warehouse houses 150 styles of pre-lit lifelike Christmas trees, garlands, ornaments, ribbons, wreaths, life-size display pieces and more! They even have an area for non-shoppers to hang out and catch some TV. Breakfast with Santa is served up at $19.99 per person unlimited video game play on your D&B game cards, a breakfast buffet that includes all the breakfast favorites, activities, $10 power card and more. Purchase your online tickets to the event at the link above. Underage policies apply. Join Arlington Historical Society from 6 to 8 pm as they help kick off the holiday season at Knapp Heritage Park. This family-friendly event will be great for children as they get a chance to visit with Santa, ride in a Christmas carriage ride, hear carols sung by the Arlington High School Choir and watch resident artisan blacksmith James Ryan in action. Then, the following day December 3, there will be children&apos;s activities, like making corn husk dolls and pine cone bird feeders, from 12 to 4 pm at the park that also includes blacksmith demonstrations, giving kids the chance to grind their own corn and decorate the park&apos;s Christmas tree in old-timey ornaments. Both events will have refreshments for purchase. This annual craft fair is always a joyous occasion for the whole family. Browse the variety of vendors to find a gift to make your Christmas memorable. Taste homemade goodies and concessions, and on Saturday, Dec. 3, Santa will be there for photo opportunities. This year will also feature an Elf Workshop for kids on Saturday. Parents will be able to drop kids off at the Elf Workshop, where they will create festive crafts, and go shopping. Free entry. Santa is stopping by to enjoy breakfast and other holiday fun activities with Arlington Parks and Recreation guests from 8-11 AM Saturday, December 10 at Cliff Nelson Recreation Center. Join the Parks Department for a holiday event for the whole family. Children will make crafts and play games and the whole family can enjoy breakfast and holiday entertainment. Mark your calendars today and make this a holiday tradition! It’s $10 per person, minimum one adult per registration. Registration required. Join the fun at Hugh Smith Recreation Center, Saturday, December 17th from 9-11 AM. There will be ornament making, cookie decorating, story time and a surprise visit from the North Pole. It’s $5 per child ages 2-8. Cameras are welcome. A replica of the White House holiday decoration theme from George W. and Laura Bush’s time there in 2004 are brought to North Texas for this fun immersive holiday experience. Check the website’s event calendar for special events happening there to accompany the replica as well as performance times for local musical acts. November 25 there will be an after-hours hot chocolate party with photos with Santa in the Oval Office. Nikki is an Arlington expert and writer. Her favorite thing to do in Arlington is visit Six Flags Over Texas with her friends or sip on borscht at Taste of Europe.